Spring onions are in season and lush green broccoli keep begging to be picked up these days. I just pick up all seasonal produce, whatever looks fresh and at it's prime stage of growth, the best way to buy your vegetables and fruits in my opinion. So the crux of the matter is, I never plan my meals in terms of flavors or cuisines or the type of vegetables or meats used, but most of the times I create my combinations while buying my vegetables. The lush green onion leaves and broccoli together in the basket, just fell in love in this instance. The resultant soup was very very soul satisfying types, along with cheddar and a dash of nutmeg and pepper. 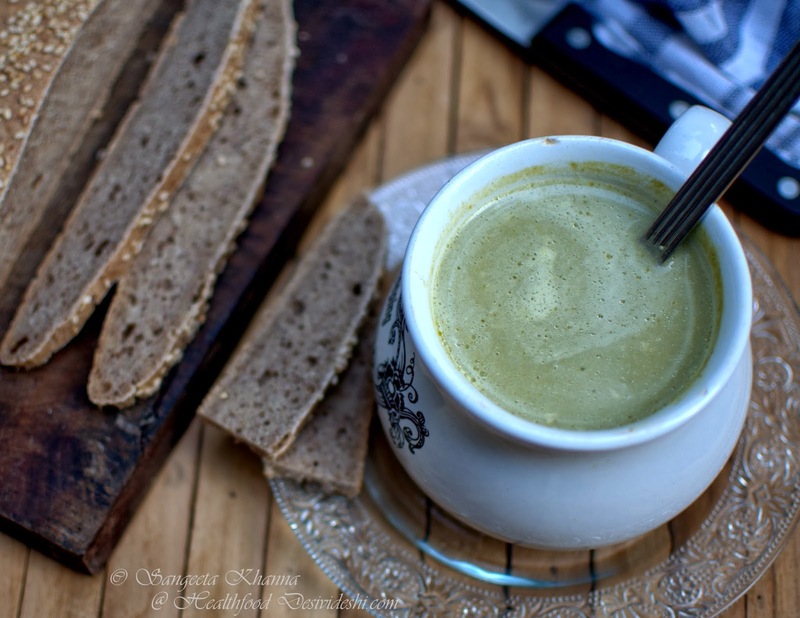 The soup has been repeated a few times already, been recommended to friends and has received rave reviews. Some like it with bread, some with a lentil cake and some like it as it is. I had it with polenta sticks one day making it a gluten free meal, and a ragi, amaranth whole wheat bread sticks the other day, a minimal gluten meal. Yummy any which way you like it. Not much of a recipe, just put things together to pressure cook, puree using a hand blender and simmer again with some cheese, little milk and a little fresh cream, a hint of nutmeg and pepper to round off the flavors. Pressure cook the broccoli, spring onion greens and garlic cloves along with salt and water. You can cook them in a stockpot till soft. Blend the cooked vegetables with the help of a hand blender or in food processor (when the cooked mixture is slightly cold) and simmer the pureed mix along with milk, cheese, cream and nutmeg and pepper, till the cheese melts and the soup turns fragrant. Adjust consistency by adding some more milk or water as you desire. 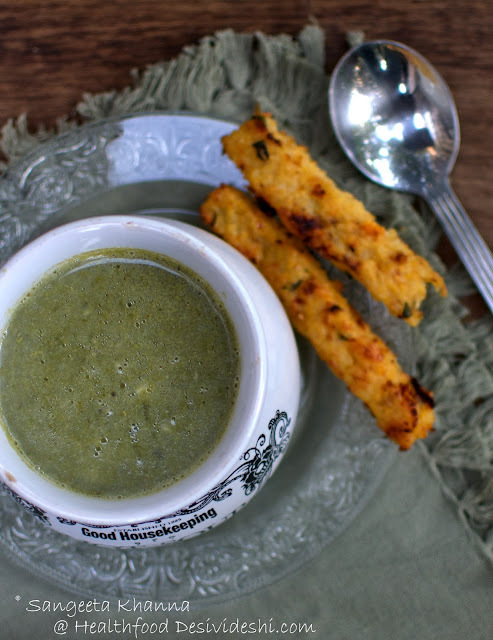 This soup makes a full meal on it's own, you can have a bread stick for texture and crunch. Very cheesy, peppery and rich flavors of broccoli and spring onions together. The soup keeps well in the fridge and even now I have the leftovers I made yesterday for the third time in 2 weeks. Just reheat in microwave and get set for a nice warming dinner. My idea of a quick yet comforting dinner in winters, especially when I have to work till late in the night. I might have 2-3 cups of kahva or lemongrass tea after an hour or so while on work. Warm liquids brace us against cold exposure even if we are not wearing enough warm clothing, which we sometimes don't feel like when the cold seems pleasant but has a sting that can render us sick. An infusion of ajwain is the best way to cure cold exposure which normally results in stomach upset these days. Few of my friends suffered such cold exposure too and ajwain infusion worked like a charm. 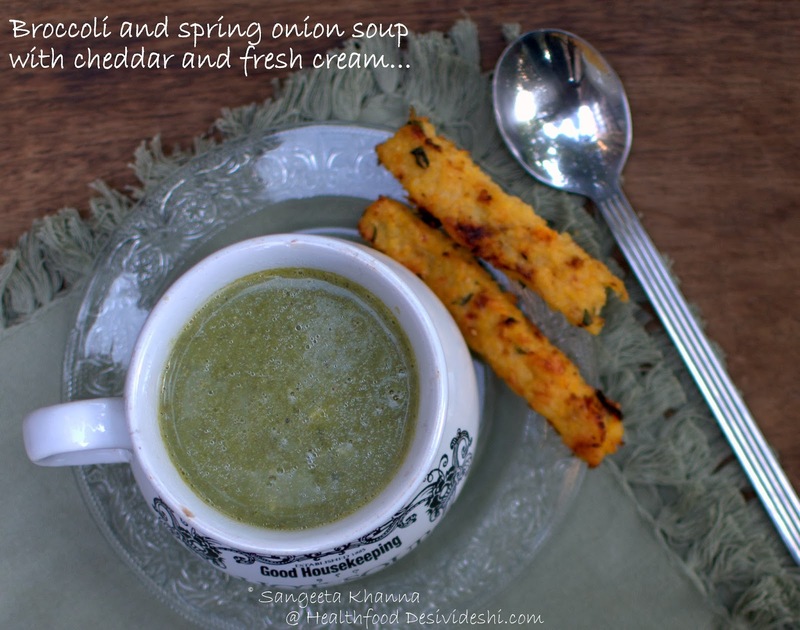 More liquid type nourishing meals like this soup helps get better quickly. Keep hydrated this winter. Keep sipping something nourishing.